— MONTY PYTHON’S THE LIFE OF BRIAN. And yea, 6,000 years ago, God did create the Earth. It took him two days, for he was a lazy god. And lo, Adam and Eve did eat of the fruit of the tree of knowledge in the Garden of Eden, thereby engendering Original Sin. 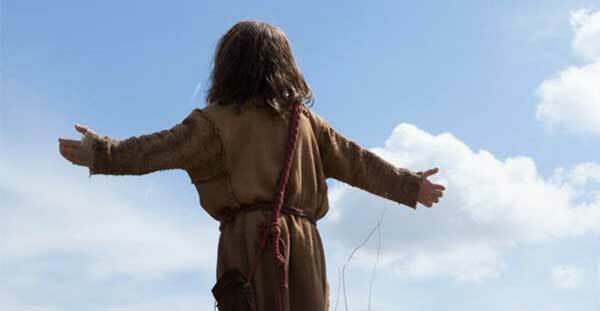 And thus, 4,000 years later, God did send his only begotten son to die for the sins of the world… THE YOUNG MESSIAH is the story of that girlish boy. 1) Why did he take so long? 2) Why is there still sin? Chronicling just one year in the life of seven-year-old Jesus of Nazareth, THE YOUNG MESSIAH still manages to cram more holier-than-thou into this one movie than any three Jesus movies combined. Young Adam Greaves-Neal is an astonishing actor, and purveys that imperious-yet-innocent attitude that is the bedrock of laying down holier-than-thou screeds. There is no Sermon On The Mount yet, but girl-boy Jesus sure slaps us upside the head with enough mystic hornswoggle to make a bible scholar break his quill off on the papyrus. He is called Jesus Bar-Joseph (due to elitist filmmakers thinking they have a handle on arcane Aramaic nomenclature), Sara Lazzaro is Mary Queen Of Scots and Vincent Walsh is her husband Joseph, the Patron Saint of Blue Balls. 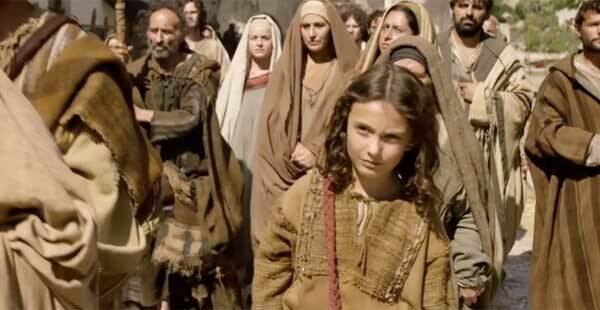 Like most Jesus movies, MESSIAH takes it for granted we know the story, so it can dive into the plot of Jesus and his parents moving from Bethlehem back to Jerusalem after fleeing King Herod’s edict to kill every boy born there seven years ago. See? I didn’t have to explain Herod or the genocide of newborns – you know it. You just know it, from years of indoctrination – even if you’re not Christian! Herod is dead. On the throne, his son Naughteous Maximus (Jonathan Bailey), a shoeless hippie with a very modern heavy metal ‘do, who has a penchant for slave girls with fantastic breast augs from the year 2016 A.D. Naughteous orders his centurions to kill every boy that is seven years old, because there is talk on the internet that the messiah survived the ethnic cleansing. In a movie built on foreshadowing and telegraphing, director Cyrus Nowrasteh (with writer Anne Rice – yes, the vampire lady – she loves dealing in people drinking blood) tries to up the excitement by having Roman centurions pursuing Jesus. A transvestite devil (Rory Keenan) also haunts Jesus’s footsteps, promoting that 1980’s new wave look of brown beard and long blond hair. At one point telling Jesus, “Your cause is lost.” Guess what – he’s right! Jesus failed to “take away the sins of the world” no matter how it’s spun by the child molesters (i.e. priests). But all these people dogging Jesus tell us the filmmakers are grasping to find a compelling climax to a tale that doesn’t go past The Christ even discovering masturbation. Heh, Romans. They’re the racist, untrained, cowardly beat cops of Biblical times. In any Jesus movie, as soon as they appear, we know they are the villains without any exposition, foreshadowing, evidence or action, and we sense they’ll kill you, just for being Jewish and Nearby. I mean, apart from the sanitation and medicine and education and irrigation and public health and roads and a freshwater system and baths and public order – What have the Romans ever done for US? But there’s an obvious spanner in the works. You see, the lead centurion is Sean Bean as Biggus Dickus. A well-known likeable guy cast as the villain can only mean he is going to show mercy. In the almost not-gripping climax, when confronted with the public choice to cut down the young messiah or let him go, he makes his decision for Christ. I mean, literally. Jesus, Mary and Joseph [not the swear words, the characters] travel with Joseph’s brother, Uncle Big Nose (Christian McKay), an affable doughy guy who is the audience’s voice. Jesus cures him of the disease of red spots by dunking him in a river, after which he proclaims, “It’s a miracle!” Calm down Big Nose, after thirty years in that filthy robe, that’s all you needed – a bath. They pick up a woman along the way, named Incontinentia. Incontinentia Buttocks. Just as they are being harassed by Romans, they are rescued by Old Sarah (Jane Lapotaire) from the People’s Front Of Judea, formerly the Judean People’s Front. In one of the great anti-climaxes, Jesus frolics on a hillside, narrating, “I think I’m here just to be alive and experience everything – even if it hurts,” Then he spreads his arms in the infamous Crucifixion Pose that is a metaphor for heroes who are sacrificing their lives for others – but he invented it, so I guess, no foul. Writers: Anne Rice, Betsy Giffen Nowrasteh, Cyrus Nowrasteh. Starring: Adam Greaves-Neal, Sara Lazzaro, Vincent Walsh, Finn Ireland, Christian McKay, Agni Scott, Jane Lapotaire, Duné Medros, Rory Keenan, Sean Bean, Clive Russell, Jonathan Bailey.